Bringing the Year of the Monkey to a happy climax, W!LD RICE’s award-winning Monkey Goes West will be returning for a strictly limited season to the Drama Centre Theatre for the holidays. Monkey Goes West completely sold out its first run in 2014, playing to an audience of more than 15,000 at the newly refurbished Victoria Theatre. It dominated the 2015 Straits Times Life! Theatre Awards with seven nominations – more than any other production that year. It eventually took home the awards for Production of the Year, Production of the Year (Reader’s Choice) and Best Costume Design (Tube Gallery). With an affectionate, cheeky script by W!LD RICE Resident Playwright Alfian Sa’at, music by acclaimed composer Elaine Chan and direction by Broadway Beng Sebastian Tan, Monkey Goes West is the first W!LD RICE pantomime to take inspiration from the East, relocating beloved Chinese literary classic Journey To The West to modern-day Singapore. Tan, who earned a Straits Times Life! Theatre Award nomination for Best Director for his work, will return to direct the production, which he describes as a “dream come true”. 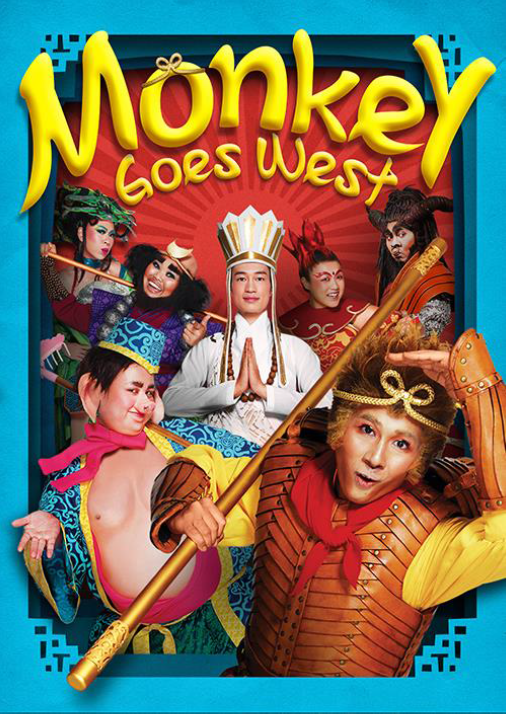 “Monkey Goes West turned out to be this award-winning show that audiences loved and couldn’t get enough of, which is really why we are bringing it back so soon,” Tan explains with pride. Young talents from Martial House – Singapore’s leading wushu academy – will be showing off their impressive martial arts skills on stage. The academy will also work closely with the children of W!LD RICE’s FIRST STAGE! programme, aged 5 to 12, in preparation for their stage debuts. The cast of Monkey Goes West includes some of Singapore’s finest veteran actors and rising stars. Familiar faces like Chua Enlai (The Importance of Being Earnest, TV’s The Noose), Siti Khalijah Zainal (HOTEL, Best Of) and Darius Tan (Army Daze, Twelve Angry Men) will share the stage with Sugie Phua (Project SuperStar, Liao Zhai Rocks!) Joshua Lim (My Mother Buys Condoms, Café), Frances Lee (Beauty World, Fat Pig) and Kimberly Chan (High Class, Hotpants). Monkey Goes West runs from 18 November–17 December 2016 at the Drama Centre Theatre. For ticketing information, please visit Sistic.